And once again, ’tis a VIDEO FRIDAY kiddies! Check out what the Minutemen of Mass have cookin’ up in the deep woods of Maine this weekend! Operation NORTHERN FIST continues…in a very ambitious and INNOVATIVE series of events! Welcome to Operation Northern Fist’s official Command and Control Center. 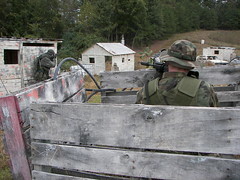 Northern Fist (NF) is a ground braking Airsoft Battle drill exercise. The exercise will take place one Sunday a month over several months. 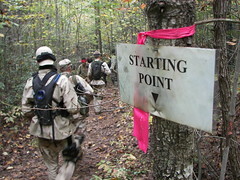 From August to December of 2009, airsofters from the New England region will be instructed by US ARMY and NATIONAL GUARD career soldiers, on assorted Battle Drills and procedures. Following each drill is an on-going series of Special Forces style missions that put the NF operators to the test on their currently instructed Battle Drills. The missions are difficult, designed to submerge the teams into real world operational stress. Pushing teams to learn and excel in woodland combat. Northern Fist truly is a military simulation exercise at its finest. Each event will consist of a new Special Forces team going behind enemy lines and conducting missions against an overwhelming enemy force. The object is stealth and mission completion. BUT REMEBER LEAVE NO MAN BEHIND. In order to accomplish such missions, training will be provided by SGT. Shadow, PFC Wiki, Moses, BornDead, and Skeptical before each Op. Shadow is a Sergeant in the Army National Guard. He has seen deployment as a Cav. Scout in Kosovo. Skeptical is a member of the Army Special Ops for the National Guard, and he has also served in Kosovo as a Cav. Scout. If you are interested in attending one or all of the Northern Fist operations, fill out the form on the registration page and your request will be reviewed. Thank you for your interest in Operation Northern Fist. Report back here for further intel and updates. OP White Horse Hill in KOREA! After Action Video of one very-snapped in event in Korea…including a BATTLE FLEET of ATV-ridin’ gun-slingers! And, our buddies from Redwolf Airsoft TV are back with their insane video madness…including an update on the Airsoft Crackdown in Mainland China… a lot closer to the sources than Thumpy is! 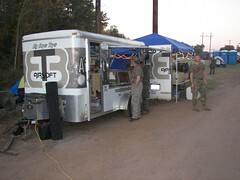 Feedback and AAR’s still flowing in from FULDA GAP 2009! And, Thumpy himself has the Mac back in operation, and is chopping up the HDV for his OWN take on the weekend, coming soon…so, stay tuned! The North Carolina Airsoft Organization (NCAO) also has some on-going and very constructive chatter and AAR’s, to make next year’s event even better! Thumpy’s New Pages and Posts this week: In case you missed them! SPECIAL REPORT: The end of Airsoft in the USA? You decide! How did this get started? 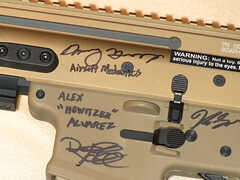 The real life story behind Thumpy’s 3-D House of Airsoft’s humble beginnings as a thread on Arnie’s Airsoft! KWA-USA KG36C Commando AEG Review…what innovative guns should be! Arnie’s Airsoft: THE Best source of airsoft news from the UK and around the Globe! 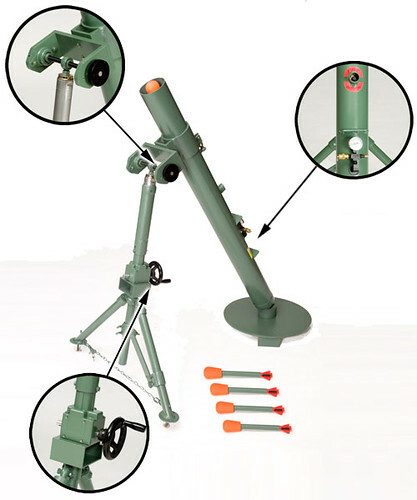 A REAL Mortar system for Airsoft! Check out the ABOUT page for a video demonstration of the features, and its range..200 yard shots? Sign me up!…Pricy? Yea, but imagine a battery of THESE “bad boys” inside your firebase! We’ll be ‘hooking up with Steve and the fellas at 11Charlie to get you more details on the M29 in the very near-future! Day One is “in the books,” for this year’s Operation Fulda Gap! Before the sun rose Saturday October 17th at Command Decisions Wargames Center in Bethlehem, NC, dozens of would-be NATO and Warsaw Pact Warriors were stirring, rolling out of tent or rolling into the parking areas. With additional staff for this 4th annual event, headed by CDWC’s Lee Ann Ferguson, things ran like clockwork, “Refs” getting pre-registered and walk-in players signed in, “banded” with blue or red wrist tags, and pushed, poked and prodded through the chronograph queue. No small feat, when the total of players for Saturday’s full-day missions totalled more than 380 participants! That once again makes Fulda Gap the largest event in NC state Airsoft history…and one of the largest regularly scheduled site hosted events anywhere on the East Coast! 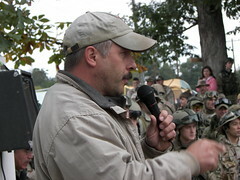 Game Guru Andrew “Ferg” Ferguson had the assembled masses gathered stage-front by 1000 hours, welcoming everyone and conducting the always-professional safety briefing, which included detailed minimum engagement distances, hit-calling rules and other regulations specific to CDWC’s 70-plus acre battlefield complex. 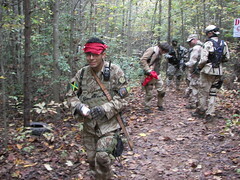 There was plenty of give-and-take, with many of the newer players taking in the North Carolina Airsoft Organization’s guidelines, and ‘veterans’ also adding and clarifying for the Fulda Gap ’09 scenarios, which includes vehicle/anti-vehicle combat, simulated airstrikes and even chemical and nuclear attacks that can be called in by the combatant commanders. This year it was the Warsaw Pact, headed again by Mike “82nd Customer” Pritchard ,versus the NATO defense with Joey “Preacher” Brunner at the helm…and from the sounding of the starting rockets, it seemed to be all uphill for the Western Alliance. While Saturday’s Night game results and Sunday’s battles are yet to be totalled, the one CERTAIN outcome of this year’s Fulda Gap is a strengthening of the Airsoft “scene” in the Southeast, centered on North Carolina…and a truly forceful push by organizers like the Fergusons, great sponsors like ESS Goggles and Tactical Duostock and others, and vendors like Airsoft Carolina and Big Boys Toys to all throw their support behind the players, makes the Grand’daddy of Airsoft events in the Tarheel State a great outcome– whatever the final score! 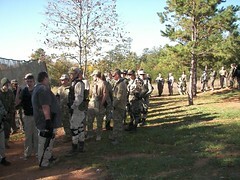 We’ll have more in-depth coverage, more photos and VIDEO of Fulda Gap in the days to come! See you all on the battlefield NEXT YEAR! FINAL UPDATE FOR OPERATION FULDA GAP! D-1 and Counting! This will be Thumpy’s final Pre-Event brief for Operation Fulda Gap 2009, with new information from “The Man” himself, Andrew “Ferg” Ferguson at Command Decisions Wargames Center in Bethlehem, NC, October 16-18, 2009…D-Day -Minus ONE and counting! No player cap on the airsoft…yet. I will allow that we have welllll over 200 registered in numerically the most perfectly balanced airsoft game we have had so far. I am assuming that is a large airsoft event? Getting close to Lion Claws yet? Field is cocked and prepped. If you have not done so already please read the information posted at www.fuldagap.com since the times and objectives are pretty similar. Read the camping rules too. Both Warsaw and NATO have their own camping areas for logistics reasons, but that doesn’t mean you get to snipe at each other between games. Lee Ann is working on getting food (pizzas) delivered during the game on Saturday, so if you want one tell her at check in. Speaking of- if you are pre-registered go to the check in station for either tan or green. We will have 2 lines. If you are a walk-on go into the store to register. Everyone must have a new waiver for this game even if you have already filled out one for this year. It is a requirement for a game this size. Do yourself a favor and download one off the www.cdpaintball.com site and fill it out before you get to the registration check in. Chrono will be open at 1600 tomorrow (Friday, 16 October) and will be up until 1900. Take advantage of that. It will reopen at 0800 Saturday (17 October). If you have a special weapon (i.e. sniper) make sure it is registered with the NCAO. Be sure to check in with your generals. They have alot of info to share. There will not be alot of tanks at this game, but still all anti-tankers need to check in with me to get their launcher inspected prior to game. Your general will issue the AT card- not me. Make darned sure you are in the parking area in front of the store at 1000 (Saturday Morning). No exceptions. If you are in the middle of prepping gear take a pause and come to the safety briefing. My refs have been studying the NCAO rules so they will be out there looking for infractions. I am sure there is more but my brain is smoked. See y’all tomorrow and Saturday. Oh, this event will be covered by media. Look pretty and somebody will make you famous. THUMPY’S 3-D HOUSE OF AIRSOFT WILL BE THERE…AND HOPEFULLY FILING UPDATES AND PHOTOS THROUGHOUT THE WEEKEND…AS HE RUNS RADIOS FOR THE WARSAW PACT AGAIN THIS YEAR! 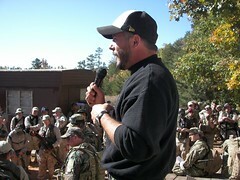 Good Luck and God Speed to all the mighty Airsoft Warriors headed to Command Decisions for Fulda Gap 2009! 15 October: SPECIAL UPDATE: See the ESS Airsoft entry below! We’ll have more details soon! OP: Fulda Gap Update…and Surprise INTEL! D-3 for OP Fulda Gap! OK Ladies and Gents, it is officially 72 hours and counting until the arrival time for one of the largest Regional Airsoft events in the U.S. of A. – Operation Fulda Gap 2009. And the latest headcount shows nearly MORE THAN 200 pre-registrations on the North Carolina Airsoft Organization (NCAO) Player Registry. Those are players in the NCAO database who say they are attending. That’s right, if you thought CDWC was already laced with trails and tactical terrain, the going just got tougher…and Airsoft participants will be the first to get to use the new additions, a full 2 weekends before the Paintball Fulda Gap players storm Bethlehem, NC! And, Ferg has one more surprise: “Action Pursuit Games Magazine will be covering the event as they try to make their entry into reporting on the airsoft scene in the United States.” That’s right, a bona fide PAINTBALL magazine is venturing into the world of AIRSOFT. If you caught the latest APG on newsstands now, they broke the ice with a short article on the North Carolina airsoft scene, featuring our very own Airsoft Carolina…and why paintball players should give airsoft a try! We’ll take ANYONE into our ranks! And, of course, Thumpy’s 3-D House of Airsoft will also be counting down the hours, and posting up comments, photos and coverage during and after FULDA GAP 2009. 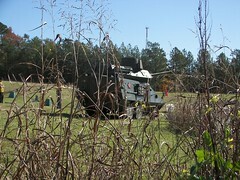 Here are some photos from last year’s Fulda Gap…Just to get your blood flow going! Let the countdown continue, and see you again AT THE GAP! ESS Airsoft Goggles joins Thumpy’s House of Madness! UPDATE: “Halo” from the North Atlantic Airsoft Expo reports that ESS AIRSOFT HAS JUST SIGNED UP AS AN EXHIBITOR AT NEXT YEAR’S PREMIER AIRSOFT EVENT!!! THANKS TO ESS and Kyle for the news! 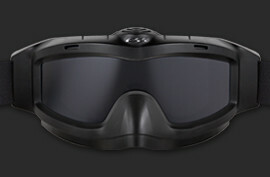 “High-speed Airsoft rounds pose a unique threat to goggles that even military goggles are not intended to protect against. 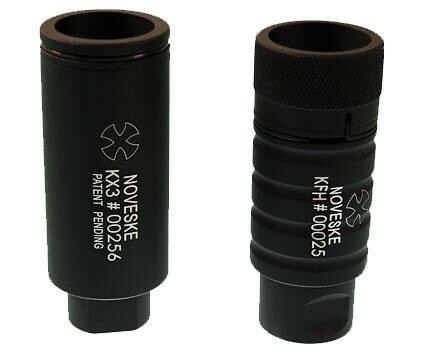 Because Airsoft rounds do not typically penetrate and embed in the skin, they can bounce and redirect in ways that shrapnel, for example, does not. Just about any goggle currently in existence can be indirectly infiltrated around the perimeter, especially if an Airsoft round hits a user around the cheek/nose area. In these cases, the round may continue to push its way underneath the goggle and into the eyes, where it can do extreme amounts of damage. 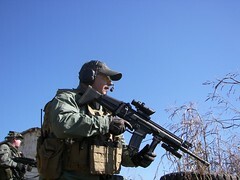 ESS took on the challenge by developing the Cortex Clip™ Series, a line of products dedicated to making it safer to wear authentic ESS military and law enforcement goggles on the Airsoft Battlefield. Welcome aboard ESS Airsoft, and we look forward to banging around in your new Airsoft goggles…and putting them through their paces. We hope they hold up as well as our current ESS TurboFans in the Carolina heat and humidity! Interesting? Heck YEA! INNOVATIVE? Possibly…we’ll keep you posted as more information develops! Envelope Please!…And the winners are? Echo 1 Airsoft came up with an ingenious, even INNOVATIVE way, to get some awesome publicity for their mahoosive line of weapons goodness. They invited the imaginations and skills of loyal customers to run amok, and held an on-line video contest with great prizes. After building up the suspense, just like the Oscars, for weeks and weeks…they pared down the finalist to the Top 10, held an online vote, and are now presenting the 3 winners. But, Thumpy’s gang thought they might need a little extra help with the “presentation” so, without further ado…or, Freddie Adu, or any ado at all…Here are the WINNERS! THUMPY “No, no…thank you, thank you, everyone, please sit down! Thank you! 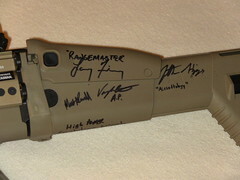 Grand Prize Winner, of an Echo 1 Minigun (Short Version), is , “Presented by Team SAS Airsoft”…. Our congratulations to all the winners…and thanks for putting an INNOVATIVE and exciting look on Airsoft that just might be the reason new players decide to make a move into our game! AIRSOFT PLAYERS TV is LIVE Again Tonight! Airsoft Players TV and crazyNCman will be back tonight…LIVE at 8PM, October 10th for the only Streaming Web TV show in AIRSOFT! Tim and the gang over at Airsoft G.I. TV have taken on THE hot topic in Airsoft right now…but you have to look beyond the review of the new WE S.C.A.R. 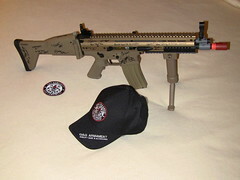 GBB Rifle. At about 2:07 into the video review, Tim takes the camera into the bowels of the ASGI shop, and interviews the “techs” working on various gas and electric guns…and he gets some pretty candid opinions about whether THEY would skirmish with a Gas Gun versus an Electric. Check out what they had to say! 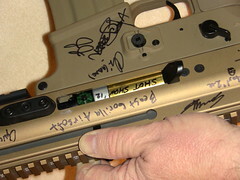 Thanks for the feedback from “Halo” and the gang from the North Atlantic Airsoft Expo. The NAA will be held March 5-7, 2010 at The Showplace in High Point, NC. You can take a 3-D look at the amazing venue HERE, and the NAA guys say the word is spreading far and wide, and some major announcements are in-the-pipeline. Stay tuned to Thumpy’s “freq” for the most-up-to-date “gouge” on the NAA 2010! New Website for Airsoft Atlanta! 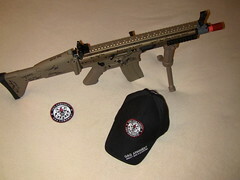 Thumpy’s not the only Airsoft Web Presence going LIVE with a new look. Our Southern Comrades-in-arms over in Hot-Lanta are mixin’ it up, with a brand new look! 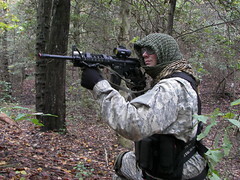 Check out Airsoft Atlanta…same great deals, “Transformers”-licious new styling. It kinda reminds the Thumpster of “Robot Wars!” I’ve gotta make the 10-hour run west someday soon and visit the Promised Land! The best airsoft store in the world! 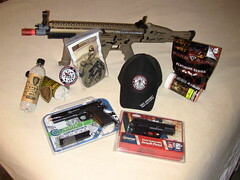 We were the first airsoft store in the USA, back in 2000, that had both a walk-in store and website sales! We carry one of the largest selections of airsoft guns, shotguns, sniper rifles, gas guns, bbs, cheap spring guns, and tactical accessories. 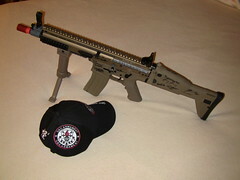 Airsoft Atlanta specializes in Japanese guns and other various rare upgrade parts as well. Stop by and check us out if you’re in Atlanta or order online if you’re not. Our warehouse ships orders out usually the same day if ordered before 5pm, along with a UPS tracking number emailed to you. Orders placed over the weekend ship on Monday. Thanks again for all your support over the years! Now, an EXCITING update on what is promising to be the first “must-attend” airsoft event on the East Coast in the Year Twenty-Ten…the North Atlantic Airsoft Expo, to be held March 5-7, 2010 at The Showplace in High Point, NC. You can take a 3-D look at the amazing venue HERE, but what is even more impressive than the location, location, location is the ambitious game-plan the organizers have for this first-of-its-kind-in the East event. The NAA Expo is designed to draw all airsoft manufactures, airsoft retailers and field / facility owners. And the NAA is also making arrangements for affordable packages for game and event coordinators, state organizations, including the North Carolina Airsoft Organization (NCAO), and organized airsoft teams. Thaggard says the Expo will increase positive public awareness of the sport and network players with the industry’s leaders. And the INNOVATORS are already signing up! The first fully registered exhibitor is Duostock Designs, well known for their highly-imaginative buttstocks for M-4/M16 variants, and retailers including Big Boy Toys, and airsoft site Blackstone Airsoft, are just 2 of the MANY exhibitors committed to the premier event. As plans proceed, Thaggard expects to be making some bigger announcements about VIP’s and INNOVATORS in what could well be THE showcase that puts AIRSOFT “On the Map” next spring. And, Thumpy’s 3-D House of Airsoft will have more EXCLUSIVE information on the NAA Expo, so stay tuned into the ‘Net, Campers. Let the countdown begin! 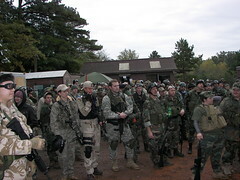 Operation FULDA GAP 2009 is coming up! What a rockin’ day to be in Airsoft! The news never seems to stop coming from all directions…(its like being pinned down behind strong cover defending a key piece of terrain!).. as INNOVATION in all sorts of new products is coming off the design computers, out of the factories…and into shops or on-line ” shopping carts” near you! If you check the historical record, Thumpy’s quest for INNOVATION began with a challenge for manufacturers like Classic Army to add blowback ONLY if it pushed realism forward without sacrificing reliability or accuracy. Looks like the T-Man might just have to eat his words, but we’ll reserve full judgment until we get our sweaty tac-gloves on one for a full-on skirmish test! These guys just ROCK Thumpy’s world! 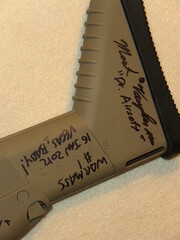 Since 2004, “J.C.” has been one of the best industrial designers for MadBull Airsoft. And when business started to bloom, with projects lining up that he wanted to take on, and with MadBull’s blessing, “J.C.” started his own airsoft business in the U.S.A. MadBull still calls SOCOM GEAR a “brother company,” and, Oh Brother, is it easy to see why they want to stay in close company! Also checking onto the ‘Net “Five-by-Five” at T3DHA is MASSIVE DEFENSE SHOP! Jackson jumped at the chance to get the word out from one of Hong Kong’s pivotal Airsoft businesses, and Thumpy’s new House came along just-in-time to get in on the ground floor of MDS’s new YouTube video channel, with some well-produced video goodness already whetting our whistle, like this Cmore style railway red-dot sight! Thanks to Jackson and the gang at MDS…’can’t WAIT to see what other surprises you have for Thumpy’s visitors. “Thank you for your kind interest in our company & products. I just scanned thru your website & it’s rather an intriguing concept indeed. I wish you well & success in bring out “the truth” for all. Lastly, pls do not hesitate to let me know how we (WE) may be of any further assistance to you & your excellent forum, alright? I truly believe airsoft-in-general needs more good souls like yourself! COMING UP TOMORROW: Thumpy’s turns ONE tomorrow…well, One WEEK old, but what a week it’s been! More INNOVATION and some incredible GAME VIDEOS make their way around the Web…and into Thumpy’s front door! ‘Sounds a bit painful, I better get out a few more chairs for the sitting room! You can check out the M4 CQB out at Airsoft G.I’s excellent on-line emporium, or get the specs and features on the KWA USA M4 CQB direct from the source, at the KWA-USA website. And, thanks again to Tim and Jan…(Thumpy Shout-Out, GFG!, hope you get more screen-time! )…and we are HAPPY to announce that Thumpy’s 3-D House of Airsoft has been granted permission by Airsoft G.I. to feature their video reviews…some of the BEST ANYWHERE ON THE WEB..right here at Thumpy’s. Thumpy’s catching the eye of the INNOVATORS! We said we’re about pushing INNOVATION in AIRSOFT and MilSim. And, the industry is already listening! WE Airsoft and WE Tactical Training International (WETTI) have checked “onto the net” and sent us along best wishes, and this wonderful poster of their very INNOVATIVE GBB SCAR-L that you can download from their website, too! Welcome aboard to RA-TECH, WE/WETTI, AIRSOFT G.I., KWA USA…and all of YOU! MORE NEWS TOMORROW ABOUT THE NEXT BIG STEP FOR THUMPY’S 3-D…AND MORE INNOVATIVE AIRSOFT COMPANIES LINING UP TO HEAR WHAT YOU HAVE TO SAY! Hot news from across the ‘pond, where our Brothers-in-Arms are showing what airsoft can be when INNOVATION mixes with INSPIRATION, and COMMUNICATION! Two Tickets, Please…to the Biggest Airsoft Show on Earth! Halloween will be someone’s lucky day, as the first tickets for next years massive “Berget 8” Game go on sale, on-line., on October 31st, 2009. For those Airsofters in-the-know, the “Berget” Series of events have become the world’s Premier Airsoft experience. Far more than just a game, Berget was conceived and developed by friends in the Härnösand area of Sweden, as a way to expand play and pick up a “few” more targets to shoot at and maneuver against. What began with a non-profit organization and 50 players in 2001 has become a professionally-produced and operated multi-day event, with everything you’ve dreamed of, all in one place. Vehicles abound, there are military style objectives and legendary firefights that sometimes have seen 300 or more combatants all slinging plastic at the same time! 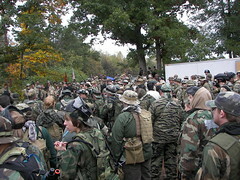 In 2007, more than 13 HUNDRED TOTAL PLAYERS squared off for some of the most-intense Airsoft warfare on the PLANET! Doubt us? OK, see for yourself! For European players, the trip to Berget is a summer pilgrimage, and for the lucky few who have made the trek from North America, it is an epiphany of what airsoft INNOVATION can truly bring to a major event. If you’d like to get in line, study the Berget 8 Website, and pay CLOSE ATTENTION to the travel, gun shipment and details via the website, and a Veteran’s Forum for details. There will be a total of 14 Hundred Tickets on sale for “Berget 8,” which will take place from June 16-19, 2010. Airsoft for Journalists? Who Knew? OK, a little background before our next story, kids. Once upon a time, a cub reporter named Thumpy actually WAS a real-life journalist, covering the military of the great US-of-A, and a pretty large part of ALL their allies, and some enemies, too. Now, we’re sure you didn’t understand a WORD of either of those well-produced TV News reports either. But, we have deciphered what the event was all about, from the MoD’s own English translation…far better than our Georgian, too! The Ministry of Defence of Georgia together with the British media organization Institute of War and Peace Reporting have arranged competition for TV journalists. The contest was held at the Vaziani Military Aerodrome today. 8 Georgian TV companies as well as Armenian and Azerbaijanian groups of TV reporters have participated in the competition. 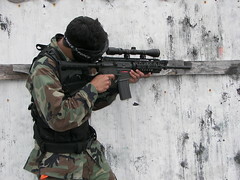 The special tasks for Georgian and foreign journalists was planed by STRIKE BALL Federation and aimed to broadcasting simulated combat operations. Representatives of the federation put up an act of terrorists’ annihilation. Terrorists had to take a general prisoner. After two-hour battle soldiers performed successfully their mission. Journalists will prepare special reportages about combat operations. The best contestant will be named by the competent jury manned by experts and Georgian and foreign journalists. An author of the best reportage will be invested with money price. The idea of the competition was suggested by the Institute of War and Peace Reporting. The purpose of this contest is to determine a level of journalists’ professionalism and their skills of emergency situations management during combat operations. So, ol’ Thumpy was on the wrong side of the globe once again. I could have put my massive airsoft AND reportorial skills together, and probably walked away with the grand prize in this one! IF I could only get someone to translate “Call Your Hits, you S&%^#%” into Azerbaijan’s native tongue! Special Thanks from T3DHA to frenlog from YouTube, who posted up both videos from the Republic of Georgia…no, not the one with the Bulldogs, either! That’s right, if you were listening carefully, you heard Nikki say that Land Warrior stands behind that gun with an 18 MONTH WARRANTY, That’s a Year-and-a-half! Several other models carry an 18 month warranty, and all other electric guns come with a 12 month/1 Year warranty STANDARD! You lads and lassies have to pay a pretty penny for your gear, and deal with the UKARA mess…it seems that the Land Warrior warranty experience more than makes up for it. Does it? Comment here and let us know your experience with Land Warrior Airsoft! AirsoftCalc 2.1 is a simple, easy to use application that allows you to calculate a wide range of things. From FPS to effective range, this program does it all. A TI-83/84 version of this program is also available. Ne sure to take the time to read the help files, which do a good job of explaining this programs potential. Thumpy particularly likes AirsoftCalc’s Battery Recharge calculators, very important for new players who might not have a smart charger in their power arsenal yet. BEFORE YOU CLICK THE LINK BELOW, A reminder that sometimes these .zip packages can have nasties attached, and the first upload had some bus reportedly fixed today…but our scan of the file shows it was clean and works AOK…DOWNLOAD AT YOUR OWN RISK! You may also want to check out HOOT’s Airsoft Search software, which is designed to help you find products from various selected retailers around the Globe! 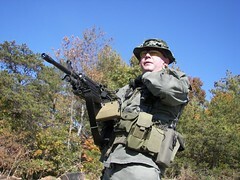 Its no secret that Thumpy has the ‘Jones” for all things Airsoft communications-related. Two years running in-the-field as an RTO (Radio-Telephone Operator, or for you Euro-types, Radioman or “Comms” guy) for the winning team at OP: Fulda Gap has pinned me into that role. SO, we found it interesting that the good folks at Echo 1 Airsoft have a little twist on the web-menu that’s “Five-By-Five” with us! Scroll to the bottom of their News Page and check out the neat “Comms” device! Now, if I could just get an FRS radio to look that good! He’s one wild and CRAZY guy! Great Job again this weekend on the web’s ONLY STREAMING VIDEO AIRSOFT SHOW….our bud crazyNCman had it going on again Saturday Night, October 3rd, with his brand new Ustream LIVE Streaming Web Cast at AirsoftPlayerTV.com. You can chat or Tweet as Frank talks guns & gear, shows some neat tricks and tips to keep you up-and-fighting…and he just might break something in the process. Wonder what he’ll tell ‘the Wally’ when they get that Multimeter back? Join in next Saturday, October 10th at around 8PM for AirsoftPlayerTV’s first live guest, on the new TWO-CAMERA LIVE Web Show, coming to a monitor near you next weekend. DON’T MISS IT! 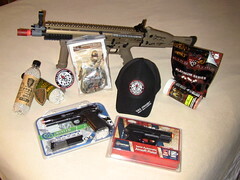 Thumpy’s newest ‘go-to’ buddy, crazyNCman, beloved brainiac and all-around impressario of crazyNCman.com, the crazyNCman YouTube Channel, and, now, the brand-new AirsoftPlayerTV Streaming Web show, has posted what is quite possibly THE ALL-TIME BEST airsoft review in, well, the history of Airsoft! You be the judge! Now, THAT is making a point, Frank! And if he’s THAT crazy on VIDEOTAPE, then just imagine what hilarity and hijinks might ensue when he goes LIVE on his new Streaming Web show, again on Saturday, October 3, starting at 8PM Eastern Time. We can also highly recommend his forum site, The Airsoft Soldier, where you can link up with characters from across the airsoft spectrum, and perhaps, get a few bytes in with THE MAN himself! Editor’s Note: We are continuing to develop details on a story promised in today’s RSS blog feed…but, hey, sometimes the “sources” and “verification” don’t come together as fast as “the boss” would like. ‘Toughter still when you ARE the boss..and every other position in the organization! We’ll keep plugging and try to get you info SOON on some INNOVATIVE pyro devices that are making their way into games across the US of A. Today is “Tube Thursday”…with a number of video offerings coming to a web-channel near you. Our buddies over at Airsoft Carolina in Asheville, NC have ‘fired up the ole’ Colortini’ and Frank (crazyncman) (See guy #3, with the minigun!) and the fellas are hosting live STREAMING airsoft shows most Saturday nights. Their new venture is called Airsoft Player TV, and this week’s offering is reported to be about AEG troubleshooting, starting at 8PM EST, or Carolina Mountain Time, which ever comes first! YOU HAVE TO CHECK THIS OUT, and watch crazyncman give the “heave-ho” to unwary post spammers and Tweet-twerps! Here’s a taste of the new AIRSOFT PLAYER TV‘s Streaming Web Show, world-wide! The guys at Redwolf Airsoft have gone Viral-Video on you, too! Check out the latest posts on their YouTube channel. Also” Hot for the YouTube” are the continuing adventures of TIM over on the Left Coast at Airsoft GI TV, who’s been cranking out videos at the cyclic rate, on new products, and some really helpful tutorials that are taking the mystery out of airsoft gun maintenance and geardo-ology! They now have over 4-THOUSAND of you as subscribers…and growing! 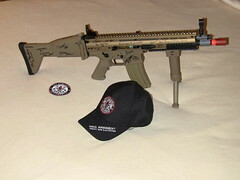 Way to go, and a tip-of-the-boonie to Tim and the guys and GAL (Jan..”Thumpy Shout Out, ‘girl!”) at Airsoft GI! Our buddies at 21st Tactical in Fayetteville, NC get a positive mention in a local news story about End-of-Fiscal Year spending at Fort Bragg. Hope it was REALLY good business. File this one away for next year, business owners, and perhaps offer some discount sale oportunities for your customers, to bring even more bucks to the bank!